There is never a quiet moment on Purim at the Friendship Circle of Brooklyn! Rabbi Berel and Chani Majesky and the rest of the FCBKLN staff worked round the clock to ensure a fantastic, amazing, and happy Purim for all the FC families. 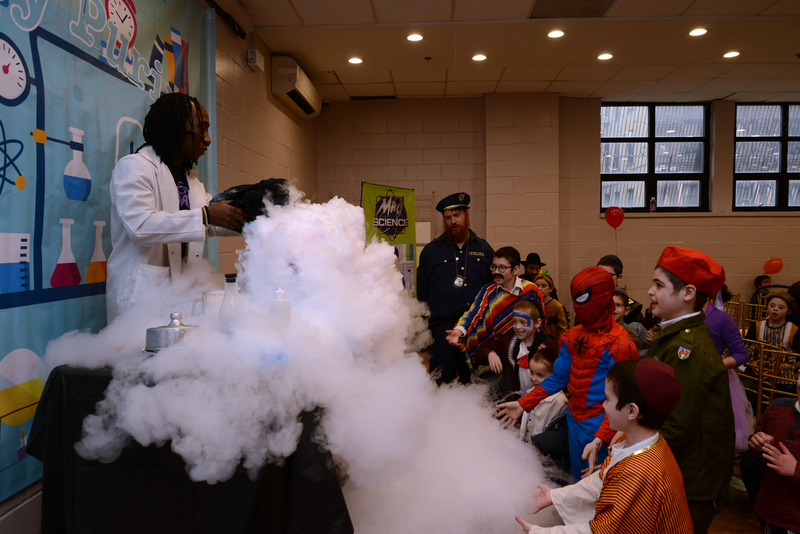 Families of children with special needs were invited to a science-themed Purim adventure with the Friendship Circle on Purim day. At the party, attendants listened to Megillah, enjoyed themed treats, and watched the suspenseful Mad Science show! The doors opened and everyone was transported to a wacky and colorful science lab. The room was carefully decorated to match the theme. Tables at the side sported an array of scientific treats, including “Proton Popcorn,” “Chemical Cupcakes,” and of course, Hamantaschen. Wacky science-themed masks and props were available near the photo booth to add a little extra something to everyone’s photos. To see everyone as they walked in with their creative costumes was such a treat! A Policeman, a superhero, Queen Esther, and more, were all present. Everyone settled down, and Rabbi Shimon Sabol read the Megilla. Then, it was time for the featured entertainment – the Fire and Ice Show with Mad Science of Westchester! Paul from Mad Science of Westchester started his performance with a lesson in combustion; the audience gasped when something in his beaker burst into flames! Then, Paul showed everyone the many things he can do with dry ice. Some kids even got a chance to “taste” it! The interactive show left everyone spellbound. As the show ended, each child was handed their very own Shalach Manos that was created and prepared by the students at ULYOP. Everyone left the Purim party with light feet and happy hearts – ready to fulfill the rest of the Mitzvos of Purim! But Simchas Purim for families of Friendship Circle Brooklyn didn’t end there. In addition to the festive party on Purim day, Friendship Circle hosted a Megillah reading at their Social and Sensory Space on Purim night. Bochurim were sent out to read the Megillah to 13 homebound families. 250 Shalach Manos were sent to Friendship Circle’s volunteers; 185 Purim cards were sent to FC partners; 204 unique FC Purim cards were purchased, 25 students from Lamplighters Yeshiva delivered Shalach Manos to children with special needs; and over 35 volunteers visited their special friends on Purim day! Thank you to Rabbi and Mrs. Berel and Chani Majesky, directors of Friendship Circle of Brooklyn, for organizing a fun-filled Purim for all! Thank you to Rochel Karp and Lulu Feldman for organizing the Purim party, and to all the volunteers who came to help set up! Thank you to Rabbi Sholly Weiser for leining Megillah, the eighth grade Bochurim from Oholei Torah for reading Megillah at peoples’ homes, to Lamplighters for partnering in the Uplift Shalach Manos program, and to all the FC volunteers!